Top helm with brass cross made of cold rolled steel with thickness of 2.0 mm. Good both for tournament and medieval fencing. 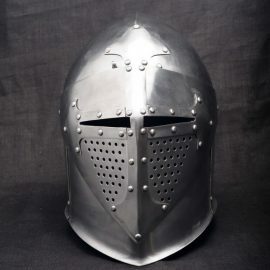 This helmet could be made of tempered steel, see options below. Ornamented light sallet. Helm is made from a cold rolled steel.Thickness of steel is 2 mm. 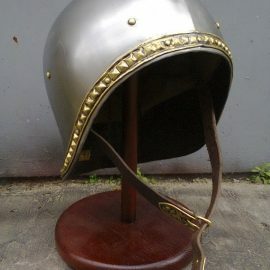 This helm could be purchased without brass decorations. 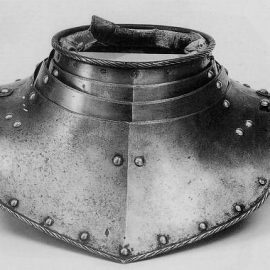 Gorget, Augsburg, 1600. This is a reconstruction of original gorget. Made of cold rolled steel with thickness of 1.5 mm.